The Israeli Foreign Ministry responded sharply to the words of Swedish Foreign Minister Margot Wallstrom on Monday, after she stated in a Swedish-language television interview that Islamic State (ISIS)’s attacks on Paris were partially fueled by Palestinian frustration. “To counteract the radicalization we must go back to the situation such as the one in the Middle East of which not the least the Palestinians see that there is no future: we must either accept a desperate situation or resort to violence,” she stated. 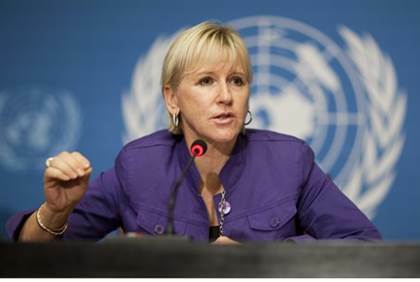 “The Swedish foreign minister is systematically biased, hostile, and one-sided against Israel when she points to the connection between the attacks in Paris and difficulties between Israel and the Palestinians,” Nachshon added. Deputy Foreign Minister Tzipi Hotovely (Likud) added that the comments were “blatant and vile anti-Semitism” and equivalent to “blood libel,” and that the MFA would make abundantly clear the severity of her statements. Shortly after the segment aired, the Swedish embassy in Israel backtracked, claiming that Wallstrom had never linked the two.